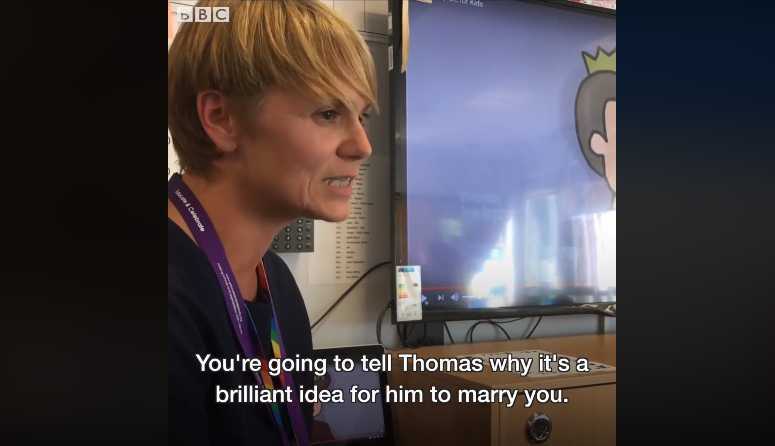 WARRINGTON — A primary school teacher was featured in a recent BBC video as she gave an assignment to six-year-old children to write a love letter from a prince to his male servant, convincing him to “marry” him. The controversial assignment has received mixed reaction from viewers, as some support the idea and others find it wrong to present such concepts to impressionable minds. In the tale, Henry becomes close friends with his servant, Thomas, as they had similar interests and would have fun together. One day, Henry’s parents decide that it is time for their son to marry and send out invitations to any who might wish to be considered as a prospective partner. Henry turns down all the princes and princesses in the land, and states that he rather wishes to “marry” Thomas. Reaction to the BBC video featuring Hopson’s assignment based on the story has been mixed. “Sad this has to be taught to override the teachings of bigoted parents,” one commenter wrote. “This is awesome! I love that this school is so open! I taught lessons like this in my 7 years as a primary school teacher,” another remarked. “Children at 6 years of age would marry their dog or favorite toy if asked; it’s not even in their spectrum of priorities. Why would you even have to teach them or pointedly direct them into any sort of relationship?” a third asked. “This seems awfully like brainwashing about sexuality at far too young an age,” another stated. “I’m more thankful everyday for private schools and homeschooling,” one said.